Vegan MoFo hits the road! I haven’t shared this with you all yet, but exciting news in my world–I accepted an offer to work with Starlight Custom Cycling Apparel as a marketing/sales opps person! While my other job was a fine job, it was just that: a job. Starlight, I have a feeling, will be a little different. It’s good times fo sho right now. And, thankfully, I was able to delay the start of that job in order to travel down to Atlanta! Homecoming 2012! 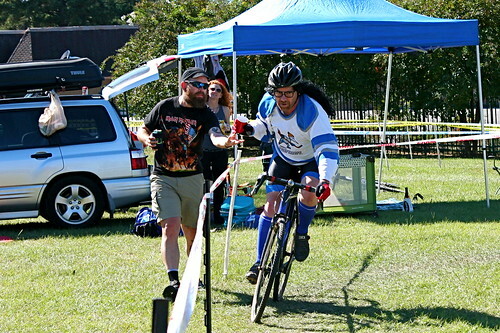 Before Atlanta, though, I took a little detour this weekend to Augusta to be with my friends for their cyclocross race. Since Charlotte is halfway between Roanoke and Augusta, I decided to grab a bite to eat there. I remembered someone blogging about a great vegan restaurant in Charlotte a year or two ago, so I opened my Google Reader & searched for “Charlotte.” Turns out there’s a great vegan blogger in Charlotte who writes VegCharlotte and is part of this year’s MoFo! While I never found the post I was looking for, I instead found a bevy of vegan restaurant reviews to click through and, I’m happy to say, I found a great vegan stop-over for lunch. Bean Vegan Cuisine is an all-vegan cafe that opened this past July. Housed in an old Tex-Mex El Rodeo-ish type building (I actually have no idea what it was in a former life, but it gave off that vibe), the restaurant itself isn’t anything to look at and actually feels a little shabby and bare (one of my only turn-offs at the place), but the food (or the bit I had) is fantastic. Since it was just lunch and I’m only one person (and stomach), I obviously held back a little–which was tough given the choices between such awesomeness as the jackfruit Crabby Patty Sandwich, a Reuben, a Bacon Cheeseburger with in-house ‘bacon,’ and a bunch of other amazing sounding meals. Torn between the Reuben & a burger, I opted for the latter, going with VegCharlotte’s recommendation of the Jalapeno Cheddar Burger. A Harmony Valley burger topped with fried jalapeno bites, Daiya cheese, lettuce, tomato, veganaise, and onion, this burger is quite the masterpiece. Though I wouldn’t normally go for the spicy burger thing, fried food is good anytime, and I loved the briny heat they added to the burger. The patty itself was nice, could have had a little more heft, less squish, but the flavor was really good. And my side of mac & cheese was pretty good too–a cashew, nutritional yeast sauce that was a tad sweet for my taste, but I loved the rich garlic overtones. If I could have eaten more meals at Bean, I would have gladly done so. I wish the restaurant were a little more inviting with some personal touches and I REALLY wish that the food would have been served on a plate (really, a basket? This isn’t the Varsity or some junky place, it’s down home vegan cooking! ), but those elements are just the gravy on the meatloaf. The food itself was incredibly good and I’ll eat there any time I swing through Charlotte (or even visit the city, who knows?). Oh! And another cool thing–I was there at 1:30 on a Saturday and tons of people were there–go vegan foodies in Charlotte, you rock! 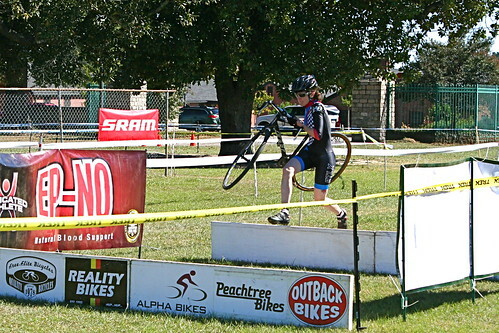 The other highlight of the weekend was definitely getting to watch/cheer at the Augusta cyclocross race. Three of my friends raced there & I was lucky enough to ring the cowbells like a crazy woman and take a bunch of photos. These three were some of my favorites (as you can see, it’s not an uber serious sport–I was handing off beer to riders and some rode in costumes–epic!). While I can race cross because I don’t have a bike that would work, I hope that one day I will because this afternoon was was too fun. Now I’m in Atlanta itself so who knows what goodness I’ll get into. Bet it will be delicious though! I’m glad you enjoyed Bean and the Jalapeno Cheddar Burger! There’s lots of good vegetarian/vegan places in Atlanta! I love Indian food and there are a number of all-vegetarian Indian restaurants in the Atlanta area, so that’s usually where I wind up eating. If you go just outside of Atlanta into Decatur, there’s a Patel Plaza with a number of Indian restaurants … my fave is Chopaati. Congratulations on the job change! I hope you really like the new one. So this means there’s a vacancy for me at the beer o’clock place, right? That sandwich looks incredible!! I’ve never had fried jalapenos but they sound like something I’d love. The place sounds great, and with a lot of tasty options. Love the cyclocross pictures! Bicyclists really know how to have fun. So that’s what’s been going on with all your mysterious tweets! Hooray for new job! 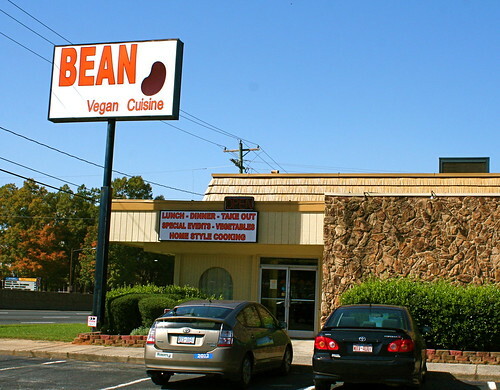 I think BEAN is one of the best vegan restaurant names ever. “Where do you want to go for brunch?” “BEAN!” Yes! The “Bean” on the sign is actually a huge pinto bean. It looks so surreal lit up at night over Independence Boulevard … but it’s a good thing because you can’t miss the restaurant in the dark! And I kind want to include Charlotte as a detour on my trip schedule for next year! Congrats on the new job! How cool! I hope you have a great time working there! Congratulations on the new job! It sounds like it’ll be super fun to work there. Awesome looking burger! 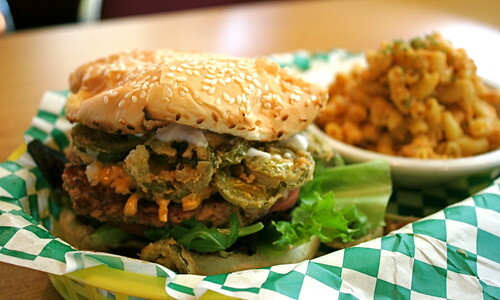 the fried jalapenos look extra good. Nothing like having too many vegan choices. Uber congrats on the new gig – sounds perfect. 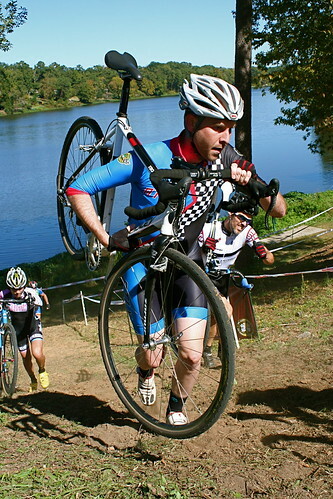 And it made me smile to see the pics of the cyclocross event – my bike is actually a cyclocross bike (a Jamis Nova), but I’ve never used it as such (I bought it because it was the closest thing I could get to a touring bike that fit my size). I’ve always wondered what it’d be like to use the bike for what it was intended – now I have some idea. Beer and dressing up. What have I been waiting for?